Hip hop music is comprised of DJing and rapping and is produced by a counter culture of hip hop enthusiasts. Other aspects of this culture include break dancing and graffiti. Although it was mainly African Americans that embodied the hip hop culture in the 1970s, it is now much more widespread through all races and cultures. Hip hop, also referred to as rap, is traced back to New York City in the 1970s. At the end of the disco and funk era, rap began to emerge. Rappers, or MCs, were originally commissioned to introduce live acts. Over time, a percussion beat would be laid down for MCs and they began to use rhythm and rhyme instead of speech. Soon, this was an art form and you could find MCs on street corners, rapping about their lives and other tales. One of the earliest hip hop artists was Kool Herc. In fact, he is often given credit for helping to create the music genre itself. Before hip hop, or rapping, was a multi-billion dollar industry, there was just a party and a turntable. DJs at parties (such as Kool Herc) would begin to shout rhymes and attendees would reciprocate with their own catchphrases and rhymes. Other early artists include D.J. Hollywood and Afrika Bambataa, both of which used African or Carribean influences. You can simply define the two aspects of hip hop music as a DJ and an MC. Although there have been many variations of this marriage over the years, it once boiled down to just that. An MC would rap, while a DJ would provide a beat via his electronic equipment or by using his own voice as a beatbox. Along with a hip hop performance; one would often see break dancing. Hip hop music was often performed on streets, nightclubs and private parties at the time of its origin. Today, a hip hop artist may have a full band and perform for a packed stadium. There are certain musical characteristics that originated from or solely exist in hip hop. One of those is turntablism. Turntables are used in rap music to sample and scratch, which manipulates a recording to the DJ's desired effect. 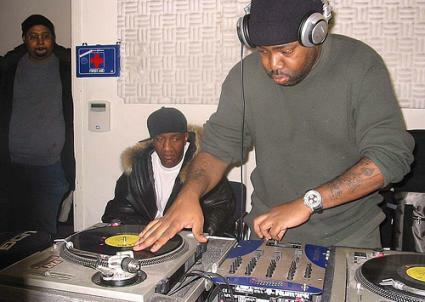 Early turntablists include Grandmaster Flash, Kool Herc, Grand Mixer DXT and Grandmaster Wizard Theodore. A phenomenon in itself, there began a tradition of turntable battles, which were contests to show who was the most skilled. Similarly, MCs often fought their way up the hip hop ranks by impromptu battling.